With increasing ridership and voter support, regional transportation agency Sound Transit is expanding its services throughout the Puget Sound area. Formed in 1996 with the approval of King, Pierce, and Snohomish county voters amidst increasing traffic congestion, ST operates now two light rail lines, several intercity express bus lines, and the Sounder commuter rail service between Everett and Lakewood. The 1996 ‘Sound Move’ measure also funded infrastructure improvements like HOV lanes, park-and-ride lots, and transit centers. As the metropolitan population is expected to to grow from 3.55 million people to 4.40 million by 2030, a coherent regional transit network will be essential to ensuring the prosperity and health of Puget Sound communities. Sound Transit’s contribution to the region’s ongoing megaprojects, which include the 520 bridge replacement and Seattle waterfront tunnel, are extensions of its Central Link light rail line. Central Link started service in 2009 and currently runs 15.6 miles north-to-south between downtown Seattle’s Westlake shopping center and the Seattle-Tacoma International Airport in SeaTac. Average daily ridership, as of July 2013, is about 32,000 and expected to grow. ST also operates the five stop, 1.6 mile Tacoma Link line in downtown Tacoma which opened in 2003. To the north, the underground University Link will extend 3.15 miles from downtown Seattle to the University of Washington’s Husky Stadium via a station in Capitol Hill. Construction is underway and service is expected to start in 2016. Further north, the 4.3 mile underground, surface, and elevated Northgate Link Extension will extend from Husky Stadium to the Northgate neighborhood via stops in the U-District and Roosevelt neighborhoods in Seattle. Construction has started and service is expected by 2021. Extending even further north, the 8.5 mile Lynnwood Link Extension would cross into Snohomish County and be open by 2023. This project is still being designed, with the track routing raising some public concern. South from the airport, the South 200th Link Extension will go 1.6 miles to Angle Lake Park in SeaTac by 2016. This is a portion of the South Link, which was cut during the 2008 recession and planned to go 23 miles to the Tacoma Dome. Further south, the 7.6 mile Federal Way Transit Extension is in the analysis stage. This is also a portion of the future South Link to Tacoma. East from downtown Seattle, the separate 14 mile East Link Extension will cross Lake Washington (on one of the I-90 floating bridges) to Bellevue and Redmond via 10 stations by 2023. It is in the final design phase with construction starting 2015, and it appears the western terminus will be the underground Chinatown Station in downtown Seattle. The Washington State Supreme Court recently ruled the project may be proceed after a lawsuit by infamous Bellevue developer Kemper Freeman. When the current projects are completed at the end of the 2023 funding period, the Link system will consist of three lines and about 53 miles of track; compare this to Portland’s 87 miles and San Francisco’s 35 mile light rail systems, though the later does not include the BART’s 104 miles of commuter rail. Indeed, the future Link system will be a cross between a local light rail service and a regional commuter service with both relatively frequent stops and long distance service. 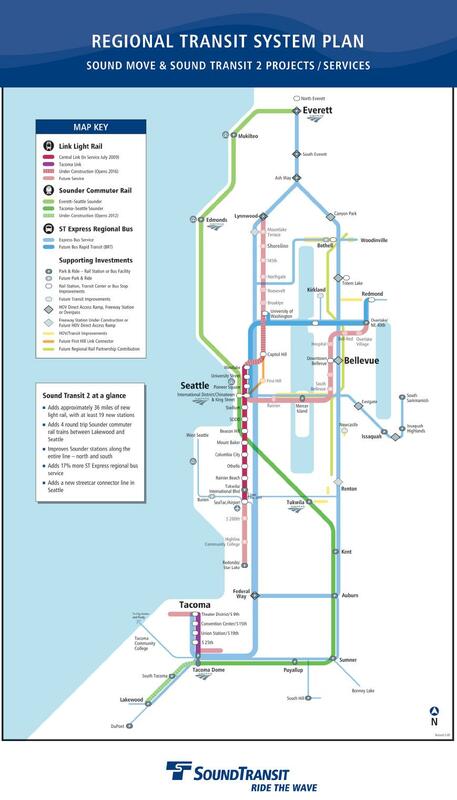 This is probably the result of the area’s geography, with Seattle being an isthmus between two bodies of water and thus encouraging a more linear, speedy service than other systems’ radial designs like in Washington, D.C. or Chicago. The South Lake Union line. 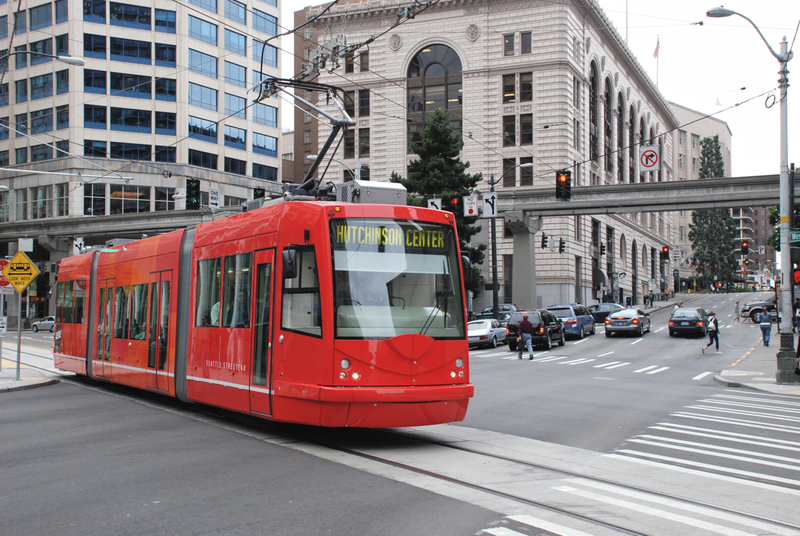 However, in addition to Link’s north-south connections throughout Seattle, the city is planning to expand its own rail network through a series of streetcar lines. 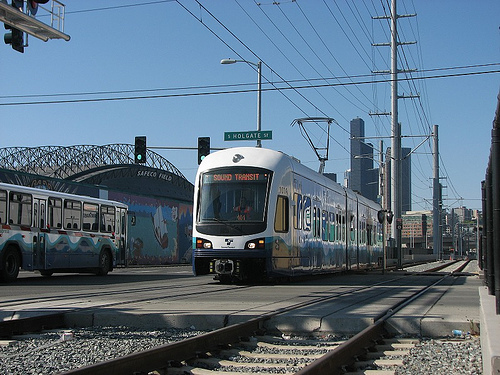 In 2007 the City of Seattle and King County Metro started jointly operating the 2.6 mile South Lake Union line with 11 stops. The First Hill line from Chinatown to Capitol Hill will open next year, and funding has been secured for a northern extension by 2016. Future extensions of these two lines may lead to stops in Fremont, Ballard, and the U-District and are in various stages of planning and funding. The Seattle DOT is also studying alternatives for a bus or streetcar connector through the Central Business District, in addition to a possible streetcar line along the revitalized Alaskan Way waterfront. These extensions will connect many Seattle neighborhoods and cities in the metro area while creating more options for commuters and visitors. Of course there are also numerous environmental benefits of electric trains using power generated by renewable energy, and streetcars have demonstrated an economical advantage over buses. But with existing highways, bus lines, and pedestrian/biking paths, these rail additions will only add to the evolution of a flexible, capacious, and vibrant multi-modal transportation system that the region needs for future growth. Did you enjoy this article? Check out the rest of the writing on The Northwest Urbanist, like the Facebook page, and follow on Twitter to get the latest updates on local planning news. This entry was posted in Megaprojects, Rail, Transportation and tagged Bellevue, Central Link, East, extensions, King County, light rail, Link, Lynnwood, metro, multi-modal, Northgate, public transit, Redmond, Seattle, sound transit, South Lake Union, stations, streetcar, Tacoma Link, University. Bookmark the permalink. Nicely written Scotty…need a link from home to work! what line light rail goes from Bellevue to Pier 66? And Pier 66 to Tacoma airport?